Inspiration Point was never a stop on the South Pacific Coast's route. In fact, it was so much not a stop that the train went directly beneath it. Yet its place in the history of the Sunset Route is unquestioned, mostly because the location was such a hub of photographic and artistic inspiration. Inspiration point was located midway between Felton Junction and Rincon Station. 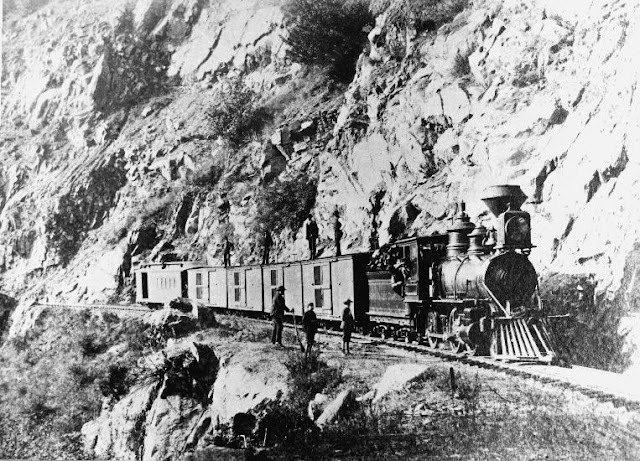 In railroad terms, it was located directly atop railroad tunnel #6. Originally, there was no tunnel at the location. When the South Pacific Coast purchased the line to complete its Mountain Route in 1879, it decided to bypass a dangerous curve on the San Lorenzo Gorge by boring a 340' whole through the base of the point. That bore lasted, through various versions and upgrades, until the mid-1990s when the original bypass was once again graded and tracks were laid down. The tunnel had caught fire and it was easier to simply go around. Today, parts of the southern cement portal is still visible but the bore itself is covered up with dirty and mudslide debris. 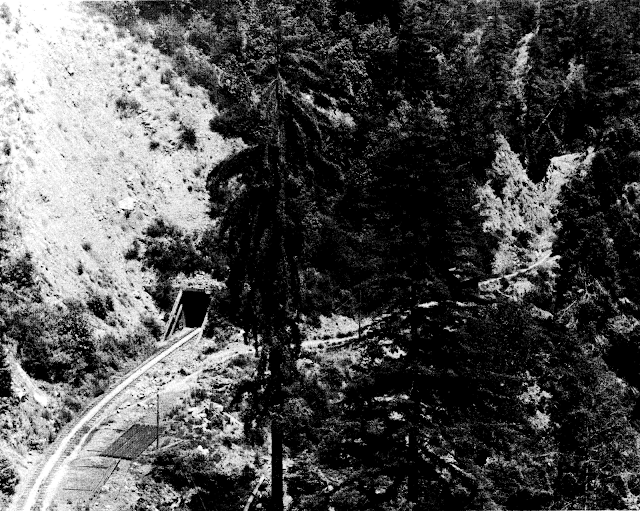 In the photograph below, the south portal of the newly-bored tunnel can be seen beside a footpath that had only recently been the narrow-gauge route around Inspiration Point. 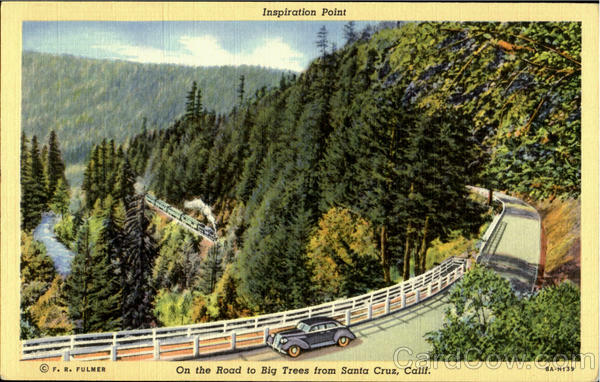 The romance of Inspiration Point made it into postcards of the 1920s and 1930s, when what became Highway 9 was a popular tourist road for those seeking a view of the forest without riding the train or paying for entry to Big Trees Park. 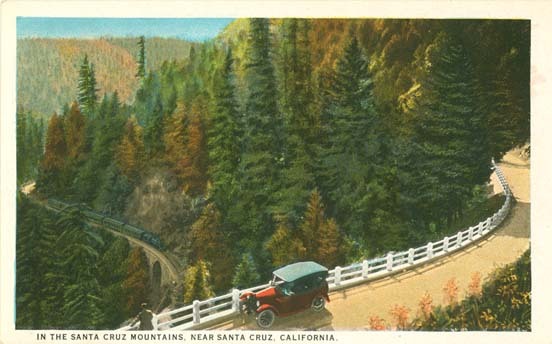 Numerous postcards were drawn showing romanticized views of San Lorenzo Gorge, the railroad tracks with a train peacefully chugging up the canyon, and a car parked at the Point. Below are just a few such photographs. One feature of the bottom postcard is the cement arch along the tracks, visible just in front of the train. This arch was built when the line was broad-gauged around 1907, though it may have been built a few years earlier when the ties were upgraded. It is the only bridge of any sort along the route between the trestle at Big Trees and the Powder Works trestle. That half-bridge itself featured in some actual photographs of the area, such as the one below, showing a freight train heading up to Felton from Santa Cruz in the 1930s. 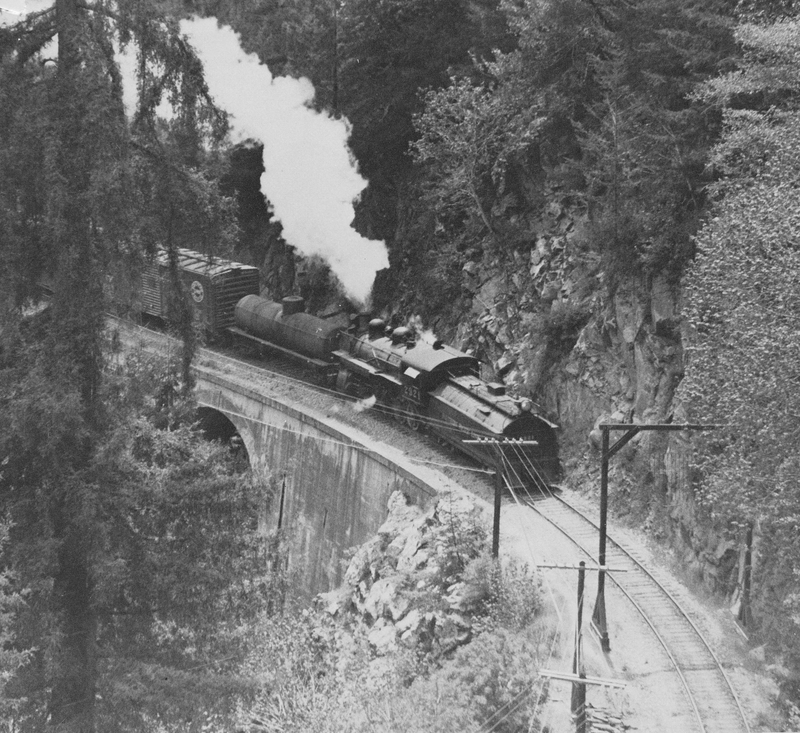 The other photograph shows a passenger train at the same spot also heading to Felton. Yet the idealism of Inspiration Point may have been overstated. A photograph, probably of the location in the late 1910s or early 1920s, shows that it was commercialized, at least for a while. The area had been heavily logged throughout the late 1800s and early 1900s, especially after the 1906 Earthquake. The idealism of later photographs undermine the fact that from 1890 to 1920, the entire area was fairly ugly. This photograph, below, of a rest stop built at the site shows how popular the site was in the period, yet how badly logged the area was following the earthquake. In addition, the location was prone to some of the worst disasters that occurred along the South Pacific Coast line. Heavily-laden trains regularly crashed and derailed along San Lorenzo Gorge near Inspiration Point just because of the sheer instability of the cliffs. If a better route to Felton could have been found, it surely would have. The cliffs claimed trains, cars, and lives. Even today, two cars from the late 1940s or early 1950s remained stripped of most parts along the cliffside above the cement arch. What happened to the cars or the passengers, no one will probably ever know, but the cars remain as a testament to the dangers of the San Lorenzo Gorge. 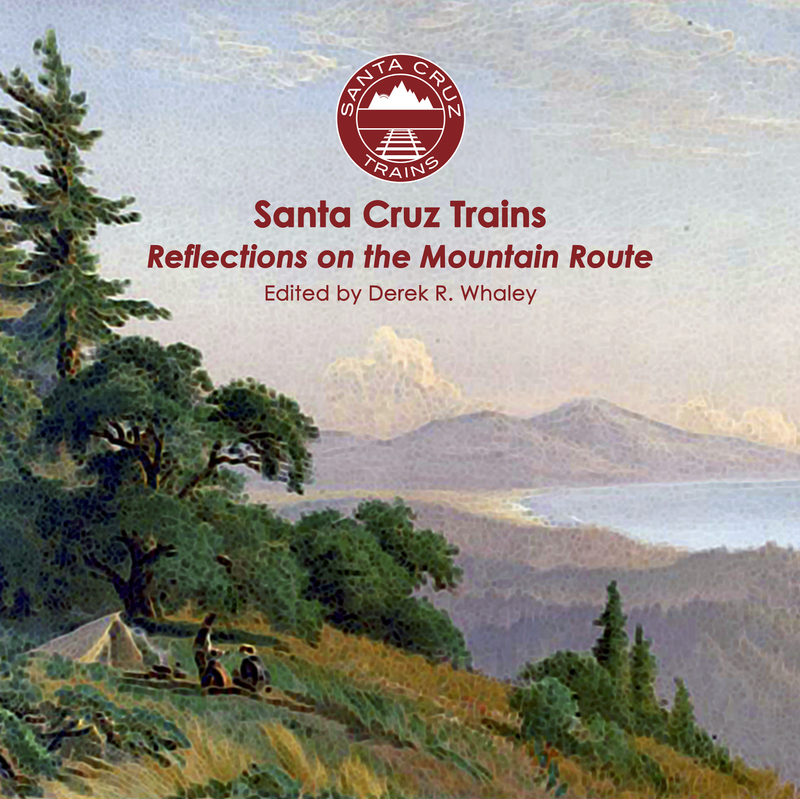 The top photograph shows a single-car passenger train cursing down the grade to Santa Cruz near Inspiration Point. The bottom shows a freight train with a passenger car heading north toward Felton. Both show just how steep and dangerous the cliffs are along the approach to Inspiration Point. 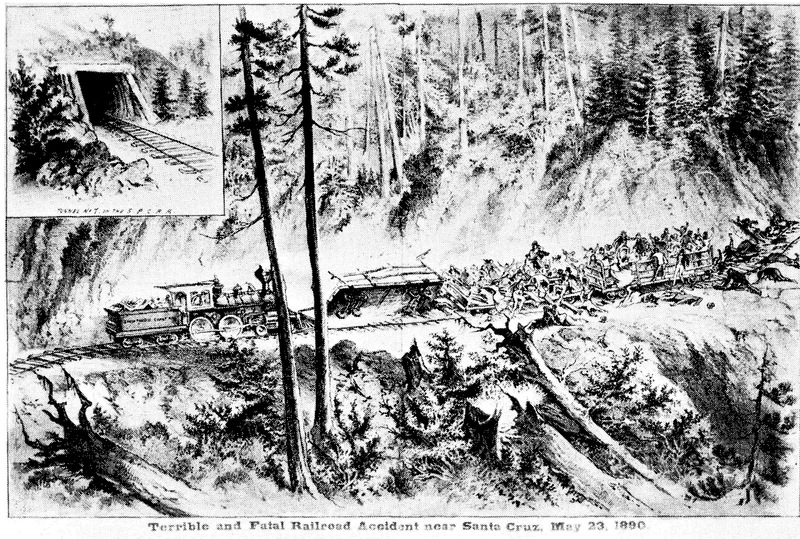 And this photograph shows a full derailment on May 23, 1890 near the same location as the previous two photographs. The sketch at the top-left corner is of the Inspiration Point tunnel (#6) which was nearby. In this wreck, a number of people were killed. 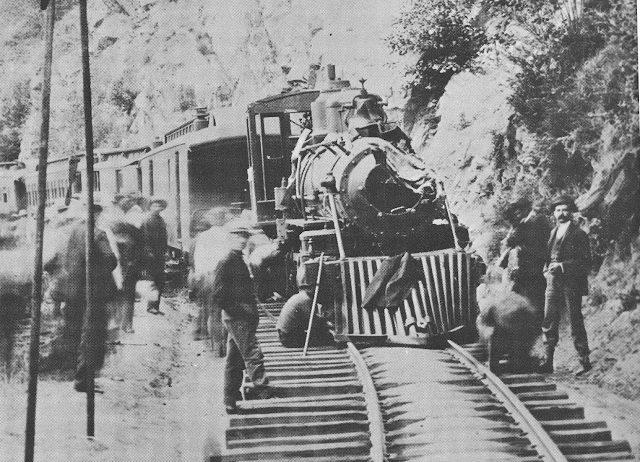 The survivors of this 1901 wreck were more fortunate, but this one was caused not by detrainment, but by a landslide as can be seen from the damage to the boiler of the engine. The train did derail, mind you, but that was not the cause of the disaster. The other cars behind appear to be on the tracks still, but the engine is askew. 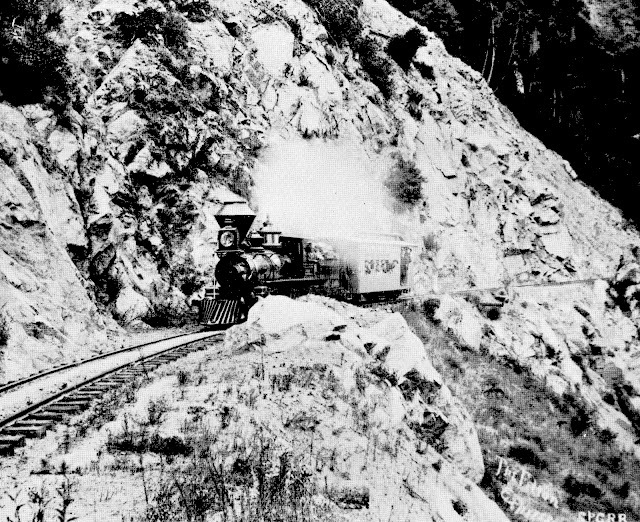 This engine was a narrow-gauge engine riding along tracks that were being prepared for broad-gauging. Note the longer ties on the left side despite no track covering them. The engine here was later repaired and remained in service for another 32 years. Inspiration Point survives today thanks to the reclamation efforts of CalTrans in the late 1990s. Traveling up Highway 9 from Santa Cruz, it is about 4 miles up the grade. From Felton, about 2 miles south. The point is fairly obvious, with parking and an emergency phone. The view is still spectacular and the train tracks wrap around the point again as they did before 1879. 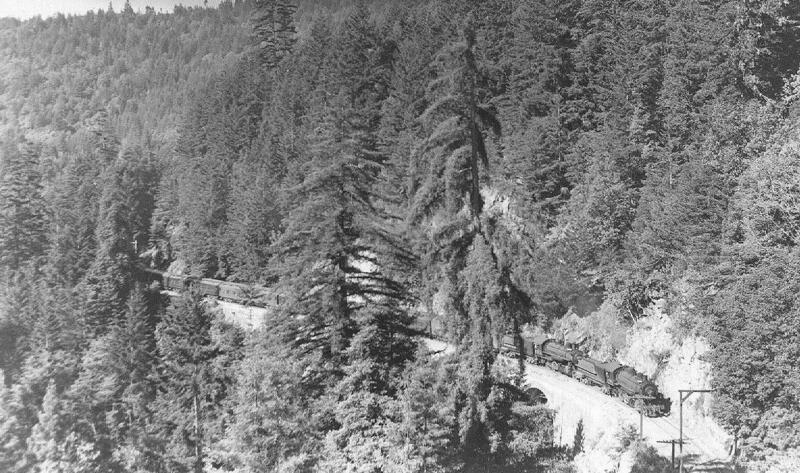 In the summer, diesel trains from Roaring Camp cruise up and down the gorge multiple times a day, but the romance of the place is mostly gone, lost to a reality that probably never existed. Today, Inspiration Point is just another part of Henry Cowell Redwoods State Park with no sign or advertisement noting its merits. In the 4th photo, that third rail is whats known as a guard rail. Its purpose is to prevent a derailed piece of equipment from wandering over and smacking the side of the tunnel. You'll commonly see them on bridges, tunnels, or anywhere with close clearances. The idea is that if a car derails in a curve, it is almost always going to go towards the outside of the curve. That guard rail will catch the backside of the inside wheel and prevent the car from going over the edge of the bridge, or in this case hitting the tunnel sets. While guard rails are referred to quite often, the term 'check rail' fits what I see here and in the Brackney photo. It was used to fight slippage on tight curves. 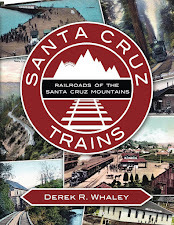 I checked out a book from Felton Library, "Santa Cruz County, Paradise of the Past", and it tells of the 1901 derailment rather more dramatically. The engine derailed due to a landslide, but its momentum kept it moving forward another 50 feet, smashing into boulders and tearing up the ties as it went. Luckily the engine was diverted towards the hillside. Had the derailment gone off the other side of the track, the engine would have taken the entire train down the into the gorge! It says the boiler was smashed and the smokestack torn off, along with a large piece of the engine cab. The tender crashed into the engine and the baggage car was derailed. The engineer James Stanley was fatally injured, but the 30 passengers were unharmed. It was a close shave, and lives were saved possibly thanks to that 3rd rail Nathan mentioned! If I remember correctly, the tunnel burned down around 1996 because I too remember going through it once via the train. Parts of the tunnel can still be seen on both sides where the intentional landslide didn't cover it. The picture was taken in the 1950s, though, I believe. The steam engine and cement wall suggest that. Honestly, I'm more interested in the date the photo of the Inspiration Point store was taken. I've never heard of it anywhere else nor seen another photo of it. I've heard of that book you mentioned before and it is on my list of local books to pick up when I...well, get a better-paying job. Fun story, though; I feel bad for James Stanley. Maybe it is time for a guerrilla plaque to be erected at the now rather generic inspiration point. What would it say, exactly, I wonder? Who knows, but I'd love to post informational plaques all along the Santa Cruz County fire road that makes up the original route. Enough people hike it every year to make it interesting. I also want to know how long that building above was at Inspiration Point. I assume it either feel off eventually or was removed after a few years. The photograph above is the only evidence I've ever seen of the place. While everything Nathan has said about a common guard rail is true, I think the picture shows an unusual use of a guide rail. I made that term up, but I mean a rail that rubs against the inside of the flange on a correctly moving train. It looks like it was removed in the later pictures, and I'm not sure of its success as they have disappeared in every case except for switches. It should be noted that steam locomotives have rigid frames that cause the larger wheels (drivers) to climb the rail on sharp turns, and that the small wheels in front of the drivers were used to feel for a curve in order to swing the frame into a curve; the chance of derailment was far less than the problem of slippage and stalls when wheels begin to climb. The freight on the concrete arch would be a photo from the 40's or early 50's, the locomotive backed up the hill to deliver at Olympia and came back down pointed forward. There was no turntable. A headlight was mounted on the tender to facilitate miles of backward operation. 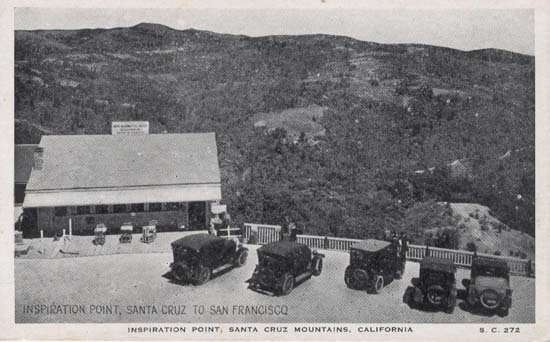 Judging by the style of automobiles parked at the Inspiration Point store, my best guess would be between 1927 and 1930 (and closer to the later date). It's been determined that the photograph of the store was not at our Inspiration Point, but another such site located elsewhere in the county. Not sure where. Maybe near Mount Madonna or something. I probably should pull the photo, but I like promoting discussion.